NeXT Computer (also called the NeXT Computer System) is a workstation computer sold by NeXT Inc. that was introduced in October 1988. Sold at a price of US$6,500 (equivalent to $13,800 in 2018) it was aimed at the higher-education market. Designed around the Motorola's 68030 CPU and 68882 floating-point coprocessor, it has a clock speed of 25 MHz. It runs the Mach and BSD-derived Unix based NeXTSTEP operating system with a proprietary GUI using a Display PostScript-based back end. The NeXT Computer enclosure consists of a 1-foot (305 mm) die-cast magnesium cube-shaped black case, which led to the machine being informally referred to as "The Cube". The NeXT Computer was succeeded by the NeXTcube, an upgraded model in 1990. The NeXT Computer was launched in October 1988 at a lavish invitation-only event, "NeXT Introduction – the Introduction to the NeXT Generation of Computers for Education" at the Louise M. Davies Symphony Hall in San Francisco, California. The next day, selected educators and software developers were invited to attend—for a $100 registration fee—the first public technical overview of the NeXT computer at an event called "The NeXT Day" at the San Francisco Hilton. It gave those interested in developing NeXT software an insight into the system's software architecture and object-oriented programming. Steve Jobs was the luncheon's speaker. In 1989, BYTE Magazine listed the NeXT Computer among the "Excellence" winners of the BYTE Awards, stating that it showed "what can be done when a personal computer is designed as a system, and not a collection of hardware elements". Citing as "truly innovative" the optical drive, DSP and object-oriented programming environment, it concluded that "the NeXT Computer is worth every penny of its $6,500 market price". It was, however, not a significant commercial success, failing to reach the level of high-volume sales like the Apple II, Commodore 64, the Macintosh, or Microsoft Windows PCs. The workstations were sold to universities, financial institutions, and government agencies. This NeXT workstation (a NeXTcube) was used by Tim Berners-Lee as the first Web server on the World Wide Web. 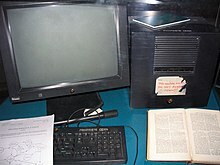 A NeXT Computer and its object oriented development tools and libraries were used by Tim Berners-Lee and Robert Cailliau at CERN to develop the world's first web server software, CERN httpd, and also used to write the first web browser, WorldWideWeb. The NeXT Computer and the same object oriented development tools and libraries were used by Jesse Tayler at Paget Press to develop the first electronic app store, the Electronic AppWrapper in the early 1990s. Issue #3 was first demonstrated to Steve Jobs at NeXTWorld Expo 1993. Pioneering PC games Doom (with its WAD level editor), Doom II, and Quake (with its respective level editor) were developed by id Software on NeXT machines. Other games based on the Doom engine such as Heretic and its sequel Hexen by Raven Software as well as Strife by Rogue Entertainment were also developed on NeXT hardware using id's tools. ^ "Apple-NeXT Merger Birthday!". Archived from the original on 2007-03-05. Wikimedia Commons has media related to NeXT. This page was last edited on 28 March 2019, at 13:42 (UTC).